There were many issues to address when women were first accepted into NASA’s Astronaut Corps. While some were important, others were mundane. All had to be decided. How could we urinate while waiting on the launch pad or during a spacewalk? Now that was a major concern of the space program and all six female Astronauts! The device made for the men wasn’t going to work for the women. While designers invented a variety of contraptions that fit the female anatomy, these things were awkward and uncomfortable. How about an adult diaper? 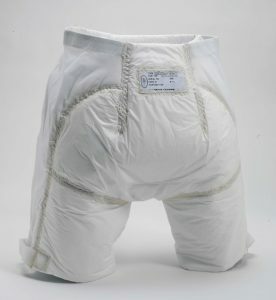 Disposable baby diapers were appearing on the market in 1978, but there weren’t any produced for adults. Not yet. So, off the engineers went to create something…anything. As with many NASA inventions, it was a little “overdesigned” since it had to work in all imaginable eventualities. What was the maximum amount of urine the bladder could possible hold? What if some urine escaped into the spacesuit during a spacewalk and drowned the spacewalker? So, the Disposable Absorption and Collection Trunk (or DACT)—built to the specific measurements of each individual woman and at a cost of several hundred dollars each—was “launched”. That worked until off-the-shelf adult diapers came on the market some years later. Male Astronauts had a few choices: small, medium, or large. Boxers or briefs? That wasn’t going to work well for the women. As you can see from our picture, we were all different sizes and shapes. NASA solved this problem by giving the females some specifications for what they might wear. After a little of the usual small talk, they came to the point. Did we want to have makeup in flight? 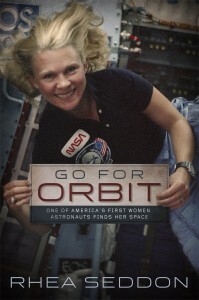 Some of the women Astronauts never wore makeup anyway, so they said adamantly “NO!” Some of us did. Was this to be a majority rule decision? I spoke up for the minority. If there would be pictures taken of me from space, I didn’t want to fade into the background so I requested some basic items. 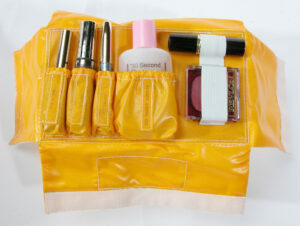 All agreed that a small kit with items of our choosing would be a “preference item,” that is, stowed only if requested. We’d love to add you to our email list. If you have not yet signed up, please do so by clicking here. Always fascinating to hear how traveling in space handleswhat we do everyday and never give thought to. Your stories also give a glimpse of inventions which meet needs in space then become part of our civilian lives such as microwave, moon blanket, dried foods reconstituted with water, and disposable diapers just to name a few. Awesome. Very interesting. These are questions that most of us have asked ourselves at one time or another. So glad to know the info. Loved the makeup kit!!!! Have you visited our Purchase Here page? Go For Orbit is available in Hardcover and both Kindle and iBooks versions. And don't forget to check out Rhea's autographed photo option as well! Click here to see Rhea’s latest video!